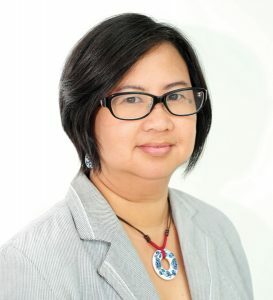 Madam G is a busy 40-something career woman, wife and mother. Over the past 3 years, she gained 30kg and became obese. When the doctor informed Madam G that she might not live to see her children get married if she didn’t do something about her weight, she embarked on a crash diet – replacing her daily meals with protein shakes. To her delight, she lost 35kg in 1 month. This new weight lasted only 6 months, unfortunately. She couldn’t keep up her liquid diet any longer, went back to her old eating habits, and her weight ballooned again until she became 20kg overweight. The truth is, there is no secret or short cut to obtaining and maintaining a healthy weight. It is all about balancing the intake of food with the amount of physical activities done to burn off the excess calories; all done in a sensible and sustainable way. Madam G made the mistake of thinking she needed to lose all of her excess weight to be healthy. The scientific truth is that no matter whatever your weight loss goal may be, a modest weight loss of 5-10% of your initial body weight is likely to produce health benefits. For example, if you are 80 kg, you need to lose 4 kg to see improvements in blood pressure, blood cholesterol level, and blood sugar level. Numerous clinical studies have shown that when you lose as little as 5- 7% of your body weight, there are remarkable improvements to your body’s ability to process blood sugars, reducing your risk of diabetes by 50%! You may still be overweight or obese, but you will learn new habits that can help you live a healthier lifestyle. These habits may help you maintain your weight loss over time. The 5-10% weight loss should be achieved gradually. Drastic weight loss methods don’t give the individual the chance to learn how to cultivate healthy eating habits which are sustainable throughout life. Scientific studies have also shown that weight loss goals usually take 6 months to achieve. Consistently choose foods with lower calorie and lower fat. Body weight is very much dependent on the amount of energy we eat and the amount of energy we expand. Hence, the participants in the study ate around 1,800 kcal a day, about 500-1,000 kcal less than their energy expenditure for Americans. 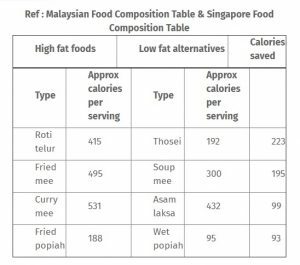 Malaysians who wish to lose weight and ensure they maintain their weight should eat around 1,500-1,800 kcal a day, especially if they lead a mostly sedentary lifestyle. Fat is one of the main contributors of calories in food. One gram of oil contributes twice the calories of one gram of sugar or protein. Hence, when we switch from high-fat foods to lower fat choices, as shown below, we save 100-200 calories or more in a day and this will help maintain a healthy weight. Eat breakfast every day of the week. In the study, 78% of registry members report eating breakfast every day of the week and reported eating cereals and fruits as the most frequent breakfast eaten. Breakfast eaters tend to eat fewer calories, less saturated fat and cholesterol and have better overall nutritional status than breakfast skippers. One study in 2005 found evidence that people who skip breakfast compensate later in the day with more refined carbohydrates and fats and fewer fruits and vegetables. But when you eat breakfast, your body feels nourished and satisfied, making you less likely to overeat the rest of the day. 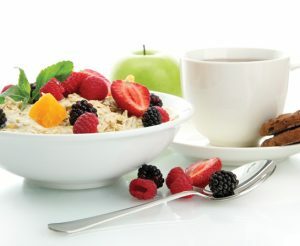 Choose healthier options when eating breakfast, preferably incorporate wholegrain choices such as capati, wholemeal bread, brown rice porridge and oats with fruits. If you never eat breakfast, try starting on the weekend when you have more time, then expand your routine to weekdays. You may be surprised how much easier your morning goes, and how much more healthily you eat throughout the day! Eat home-cooked foods more often. Those who are successful in losing and maintaining weight report consuming only 2.5 meals a week in restaurants and less than once a week of their meals in fast food establishments. A recent study by John Hopkins University Researchers examined the self-reported food records obtained from more than 9,000 adults, aged 20 and older. The study showed that the most frequent home cooks consumed around 200 fewer calories daily, and around 16 grams of sugar (4 teaspoons). Recently with the increase of food costs in restaurants and eateries, Malaysians have been bringing their own lunch from home, perhaps a healthy consequence of GST implementation. Suitable meals to bring from home include wholemeal sandwiches or a balanced meal of rice with vegetables and chicken/ fish (which may be heated leftovers from dinner last night, topped up with vegetables and fruits). Engage in high levels of physical activity. Another characteristic observed by researchers of weight maintainers was their engagement in high levels of physical activity. They performed at least 1 hour of moderate-intensity activity, most days of the week and majority (76%) of the participants did brisk walking. If you have rarely been active, you could begin with at least 30 minutes of exercise 3 times a week and gradually build it to 5 days a week and a longer duration of 60-90 minutes. 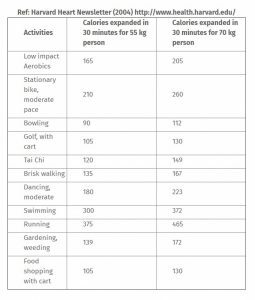 The table below shows the energy you would expend if you were to perform the various activities for half an hour. Monitor weight once a week. This frequent monitoring of weight would allow you to catch small weight gains and initiate corrective behaviour changes. A study conducted on 1,226 adults who were enrolled in a weight gain prevention trial, and 1,800 adults who were enrolled in a weight loss trial showed that higher weighing frequency was associated with greater 24-month weight loss or less weight gain and lower fat intake. Hence, perhaps one of the best things to do if you wish to have a healthy weight is to invest in a good durable weighing machine at home, weigh yourself once a week before meals and take action early if you see the needle going up before it gets worse! Be consistent in your eating habits. How many times have we looked at a piece of cheesecake and thought, “I’ll start my diet again tomorrow!”? Well, being consistent is the final secret to maintaining a healthy weight! Interestingly, results from the NCWR study indicated that participants who reported a consistent diet across the week were 1.5 times more likely to maintain their weight over the subsequent year compared to participants who dieted more strictly on weekdays. Individuals who were “flexible” and ate high-calorie foods on holidays had greater weight re-gain than those who were more disciplined and maintained consistent healthy eating habits. Hence, it is perfectly fine if 9 out of 10 times we choose to have fruit salad instead of cheesecake at the buffet lunch table! M. N. Ismail, S. S. Chee, H. Nawawi, K. Yusoff, T. O. Lim and W. P. T. James. (2002). Obesity In Malaysia. Obesity reviews 3: 203–208.